"The All-India Muslim League urges upon His Majesty’s Government to give representation to the Muslim League on the Palestine Conference and concede the Palestine National Arab demands. Muslim India is most anxiously awaiting results. I cannot by means of a telegram express adequately and impress the intensity of feeling prevailing throughout India. The failure of the Conference will be most disastrous throughout the Muslim world, resulting in grave consequences. I trust that this earnest appeal will receive your serious consideration." Source: South Asian Studies: bi-annual Research Journal, Vol. 17,No. 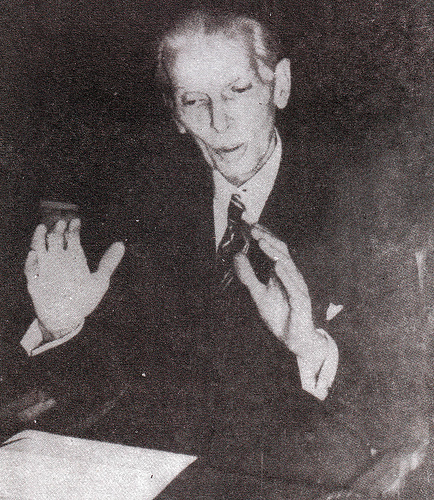 1 (Quaid-i-Azam Number) January 2002, PP. 91. Also cited in The Civil & Military Gazette, February 1, 1939.